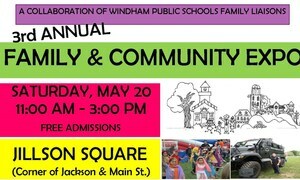 Windham Public Schools' Community Expo This Saturday! Free fun for the whole family at Jillson Square! On Saturday, May 20 from 11:00 AM-3:00 PM FREE Admission--Parking--Giveaways ! The Windham Public School Department of Family and Community Partnerships will be hosting the Third Annual Community EXPO on Jillson Square, Willimantic, from 11:30 AM-3:00 PM, Saturday, May 20, 2017.